After about 4-5 hours with the game, I feel like The Division is the videogame equivalent of going to a nightclub on your own. Everyone seems to be having a great time, there's plenty of eye-candy to look at and you can have passing interactions with people within your close proximity, but it's also the loneliest experience you could possibly have. The city is HUGE, but the matchmaking system allows you to completely bypass exploration of it by letting you fast-travel everywhere. I've had mixed results with the handful of groups I've joined so far. The best example was in the first medical-wing mission where the game paired me up with a chap from France. There was a nice bit of banter between us and we kept pace with each other, covering each other and not charging off ahead. At the end of the mission we went our separate ways, but the experience felt satisfyingly collaborative. Other missions have not been so successful. In one group there were two players, or at least one player who felt the need to sprint through the level like he'd done it all before (in which case, play it on hard and leave the default difficulty for players experiencing the content for the first time maybe?). I think there may have been another player in the team besides myself, but I was running so hard after the other two that I could barely register him. And this was the mission where the flamethrower guys are introduced. It wasn't until the party almost wiped on the final boss encounter that I witnessed any teamwork. 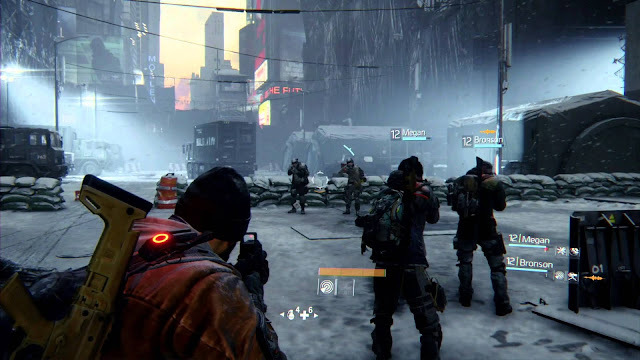 Ultimately I think The Division is a great idea that's tainted by the sheer range of human beings that inhabit it. I'm really intrigued by the customisation options and the different tactics the upgrade trees will surely open up, but I'm still finding the experience quite disposable. The narrative hook here is all about chaos in the aftermath of a biological disaster, but will the chaos of other players' behaviour prevent me from following it?